Anyone visiting your DriveWorks Live site will be directed to the Login page by default. This is to ensure only visitors with credentials that have been administered through DriveWorks Security Settings have access to start a specification. The Login page can be bypassed by logging all visitors into the site with a generic username through the Integration module. To use the Auto-Login feature you will require the Integration page to be loaded when the web address is typed, rather than the Login page. You then need to configure the Integration page to login with a specific Username and Password. This can be achieved by following the steps below. 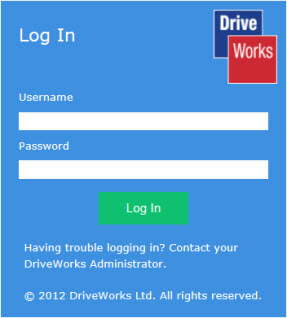 With DriveWorks Live started, browse to the URL that hosts the group and log in as an Administrator. Once logged in, add /Integration onto the end of the web address. Click the (Switch) link to enter edit mode on the Integration page. Click Edit on the Integration module in the middle of your screen. Enter the Username and Password of the User that you want to auto log in, and check the Auto Log In option. Click Save on the Edit Module dialog. Click Save Changes at the top of the Integration page. Locate and copy the Navigation.xml file as instructed in the topic Customize the Web Theme - Advanced (refer to the table under the heading System Files and Custom Files). Now when browsing to your DriveWorks project you will be automatically logged in. To log in as a different user, you first have to log out (close the browser or click logout), browse to the website and add /Login to the URL. If you want to change who is automatically logged in you will have to go back to the Integration module, because there is now an Auto Login the /Integration suffix cannot be used. To access the Integration page add the following to the URL. The Integration module can be edited on the Integration page by following steps 3 to 6 above. More information on the Integration module can be found using the following link Integration Module.